When a restaurant has a 25-person line during prime dining hours and a taco-centric menu that contains reasonably limited choices, you know there’s something magical going on in the kitchen. How fitting that today’s Gluten-Free Friday features Mojo’s Tacos, a “fresh and innovative taco shop” that wows me with its “magic charm” meals. 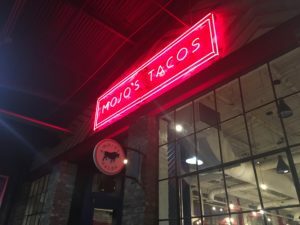 Mojo’s Tacos is located in the historic Factory at Franklin, which is prime real estate for a Franklin dining spot. Any restaurant that can afford to open shop in the Factory and actually fill the place, day-in and day-out, has my attention. After you eat at Mojo’s, I think you will understand why it is thriving in the Factory. Shockingly (please note my sarcasm), I have a regular at Mojo’s. I always get the Brisket Taco unless, on tragic days, it’s not available (the wizard must have captured it on those days), in which case I get The Old School without cheese. 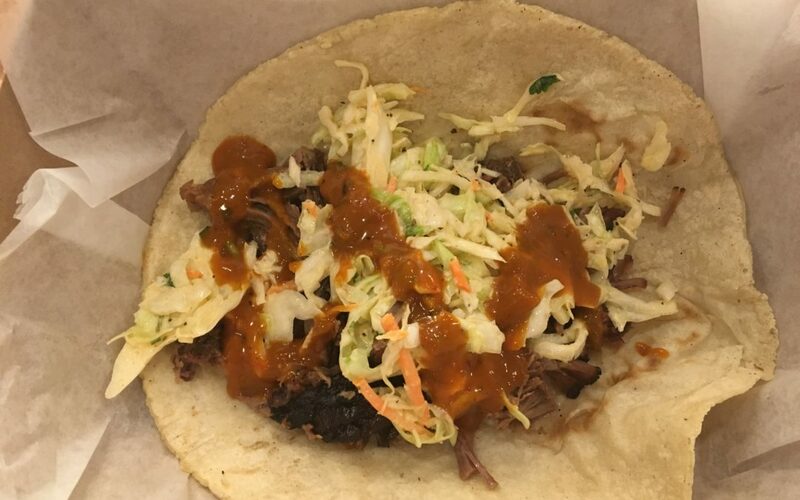 But the Brisket Taco is a lovely choice: The taco drips with an otherworldly, flavorful juice, the brisket is perfectly moist and rich, and the toppings add a Tinkerbell-style fairy dust on top. Regardless of what you order, if you are sensitive to gluten, make sure you ask for a corn tortilla. The corn tortillas there are soft and flexible, so you won’t feel like you’re missing out on the traditional flour tortilla. Before you jump up to fly after your pixie-dust meal, hold those happy thoughts and remember Mojo’s generous portions: One corn taco stretches about six or so inches in diameter, and Mojo’s does not skimp on the fillings. If you are really hungry, pair two tacos with a side of chips and salsa for a filling meal whose grand total is only $10, not including tax. Not a bad night out, am I right? Since I am gluten-free, there are only four or five, out of 11, taco options I can choose from. Once you throw in dairy-free restrictions, you are left with two options that don’t have to be prepared differently (i.e., sans cheese). Honestly, I’m not bothered by that. A taco without sour cream and cheese may seem a bit plain at traditional Mexican restaurants, but not at Mojo’s. With slaw, fun sauces and juicy meat, Mojo’s taco options have convinced me to not complain about a lack of dairy. When you go to Mojo’s, be prepared for about a 30-minute drive from campus, not including much traffic. Make a fun night of it since Mojo’s Tacos is less than one mile from adorable Downtown Franklin. Enjoy a girls’ or guys’ night out, starting at Mojo’s and ending at the new rolled ice cream shop, T-op, near Five Points in Downtown Franklin. Or embark on an adventurous date night at Liveminds Adventure Escape (near the Highway 96 and I-65 junction), followed by dinner at Mojo’s. Just go. Figure out the rest of your plans after you have embraced the beauty that is Mojo’s Tacos. Enjoy your Franklin night out at Mojo’s this weekend. And if you figure out what really puts the “mojo” in Mojo’s, let me know.